Tailoring your horse's work will help him to build muscle safely, avoid repetitive strain and help to ensure that he has the right level of fitness for his work load. 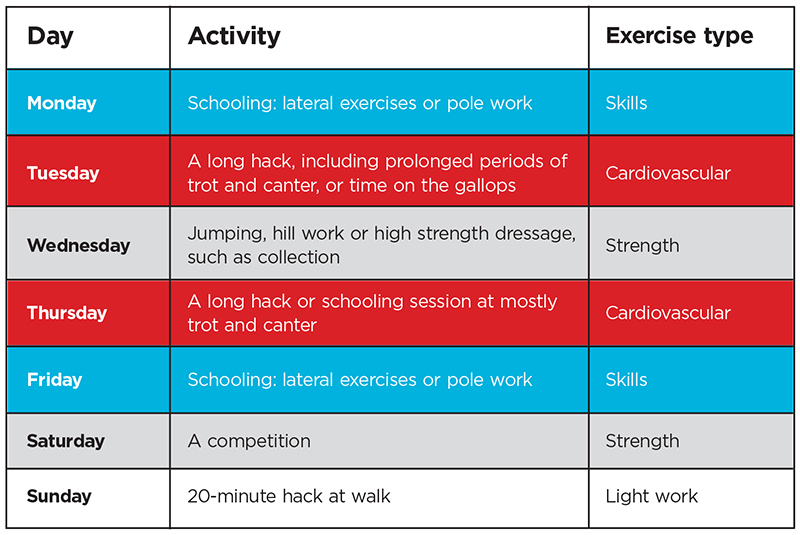 To create a training programme for a strong horse you'll need to combine schooling and jumping with hacking. Plus, you'll need to allow time for him to recover between sessions. Your horse’s muscles are most at risk during strength training (this may include hill work or jumping). So, to help prevent injury, you need to gradually increase the intensity of this type of work. Use the plan, below, as a rough guide as to what to do with your horse, when. As a rule, allow at least two days between strength training sessions to give your horse’s muscles time to repair.